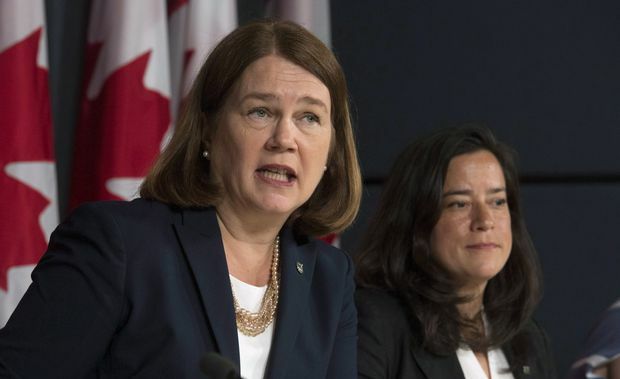 Health Minister Jane Philpott responds to a question as Minister of Justice and Attorney General of Canada Jody Wilson-Raybould looks on during a news conference in Ottawa, June 30, 2016. Philpott has resigned from the federal cabinet, saying she's lost confidence in the way the Trudeau government has dealt with the SNC-Lavalin affair. Losing one cabinet minister who resigns on principle can be considered a misfortune. Losing two smacks of crisis. If any other cabinet minister had quit Justin Trudeau’s cabinet after Jody Wilson-Raybould’s stand in the SNC-Lavalin affair, it would have been bad. When it is Jane Philpott, a paragon of principle who is no pie-eyed dreamer, it is Mr. Trudeau’s government falling apart from the inside. The second resignation will be worse than the first. Ms. Wilson-Raybould, the former justice minister and attorney-general, has shaken Mr. Trudeau’s government with testimony that detailed allegations that Mr. Trudeau and his operatives had attempted to politically interfere to defer the bribery prosecution of SNC-Lavalin. That was a big blow. Yet, Mr. Trudeau’s team was just about to tell that story differently, portraying Ms. Wilson-Raybould as one person telling one side of a story that involved many. There have been hints that part of the government version is that Ms. Wilson-Raybould wasn’t really alive to the hard reality that the prosecution could cost lots of jobs. But now Ms. Philpott is a second. She’s no ivory-tower sentimentalist. If some wondered whether Ms. Wilson-Raybould was simply angry at her demotion, no one can think that’s the case for Ms. Philpott. She was just promoted. And her resignation is an implicit endorsement of Ms. Wilson-Raybould’s version, and an explicit condemnation of Mr. Trudeau’s. That’s more than two whacks at the Justin Trudeau brand. He’s the feminist Prime Minister, the leader who promised a new relationship with Indigenous peoples and open and accountable government. Two strong women in his cabinet, one the first Indigenous woman justice minister and another known for principle and competence, have just said they can’t stay in his cabinet any more. She spent part of her life practising medicine in Africa, inspired by work in Kenya during medical school. “I realized then just how deeply unfair the world is in terms in terms of access to good health, and health care,” she said in the interview. She later spent nine years practising medicine in southeastern Niger, describing it as an experience she loved, although it included the worst moment of her life – the death of her first daughter from meningococcemia. As Health Minister, she worked closely with Ms. Wilson-Raybould on the government’s court-ordered assisted-dying bill – perhaps cementing their friendship. Behind the scenes, she earned praise for competence. And she is not known for Pollyannaish shrinking from hard facts. As Minister of Indigenous Affairs, she outlined the mandate of her young department with an hour-long public presentation of the dire social indicators facing Indigenous people − shorter life spans, higher rates of foster care and extremely high rates of disease. “It doesn’t help anyone to be in denial,” she said then. It’s hard to say if others will follow. New Brunswick Liberal MP Wayne Long, a caucus maverick, issued a statement reiterating his call for a full investigation. There might be one or two more in cabinet, perhaps those close to Ms. Wilson-Raybould, who will think about following Ms. Philpott. Probably not more. Yet, Mr. Trudeau’s government is still falling apart on the inside. Think for a moment about Liberal caucus meetings with Ms. Wilson-Raybould and Ms. Philpott in the room. Mr. Trudeau said Monday that he hasn’t decided whether Ms. Wilson-Raybould will remain a Liberal MP. That decision is much harder now. Ms. Philpott complained about the handling of the affair – not competence, but principle − suggesting that the PM has lost his way. Can Mr. Trudeau – the listener, the leader who promised to do politics differently – respond by kicking them out? Sure he can, but not without ripping a few bricks out of the Trudeau edifice.